I have been on a streak of finding awesome artist's, and I found Connor Nolan a couple of days back. Love this guys stuff! 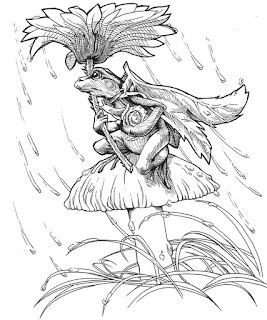 So I kind of felt like drawing frogs - and I love rain so that just magically started happening too. So I went back to pencil and pen and ink, which I haven't done in a long time, and MAN do I need practice!